Oh how I wish this were the law of the land. Simple and effective. would really go for such a policy? Rewarding people for breaking our country's laws is not going to stop them from breaking our laws. 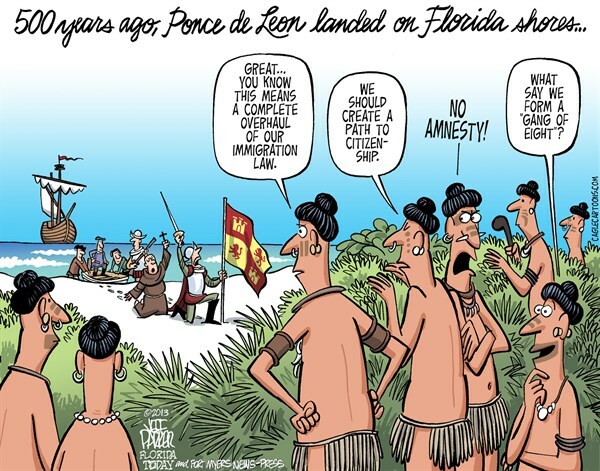 They chose to come here and be here illegally -- so what's the point in rewarding them for doing so? At the very least, leave them in that status, it's not as though they're going to get mad and go back home. They're easier to deport when they become a problem if they are illegals and giving them easy citizenship is unnecessary and counterproductive. Not THIS American. Come here LEGAL or DON'T come to the US. The "down trodden" of the past didn't engage in identity theft or pump out Anchor babies for welfare, no comparison.